This sign is just behind a small fence, but facing the highway it looks like a sign that should be warning you about something. The first time I saw it, I looked over because I wanted to see if there was a traffic issue. 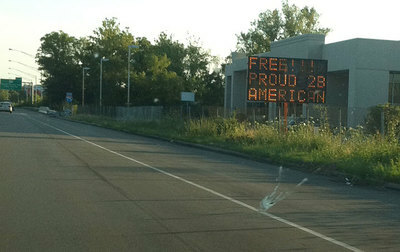 I don’t mind the sentiment, but I think the sign is a real distraction and should not be allowed to face the highway. It’s on southbound 75 in Lockland before you reach Ronald Reagan Highway. An iPad in the hands of an artist. This video is definitely worth a look. I’ve been a fan of David Kassan’s works for a while. His paintings look almost like photographs. I have Brushes for the iPad, but the chance of me creating something like this is about the same as a monkey creating Shakespeare. The guys who created the T-shirt war video were able to parlay that into a McDonald’s/Coke commercial. These days if you have a creative idea and want to break into the business, you should just do it. If it’s good, people will find it. 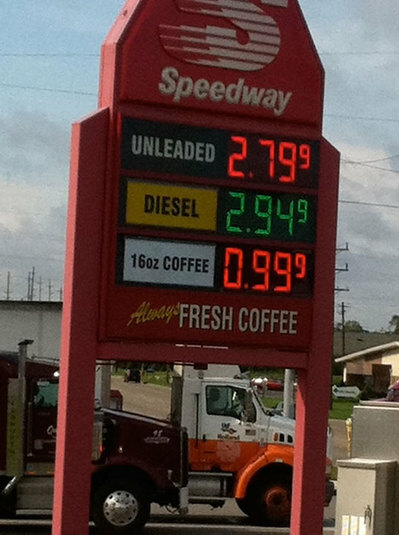 Is that .99 and 9/10 dollars? A great win for Lu Yen-hsun and Taiwan. I watched the fifth set and I was amazed at the poise that Lu showed. If you’re going to upset a top 10 player like Lu did, you usually don’t do it in the fifth set where nerves and fatigue can overwhelm you. I was at the gym last night where I ran into some of my parents’ Taiwanese friends. They were all smiles and extremely moved by Lu’s victory. It’s like one of their own kids had won at Wimbledon. The Taiwanese community in Cincinnati has a personal connection with Lu. Last year at the Cincinnati Masters, a Taiwanese family hosted Lu during the tournament and the community had a dinner in his honor after he lost. I’m sure that they’ll be doing it again this year. 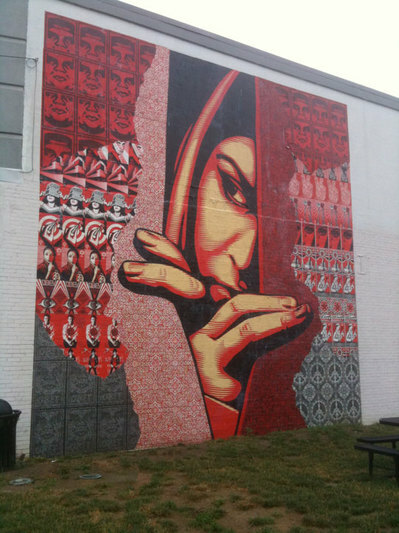 Finally got out to Silverton to see one of Shepard Fairey’s outdoor installations here in Cincinnati. The main image in this installation is Israel/Palestine. I love how the curtains are made of smaller prints that she’s pulling aside to peer out. By some estimates, there may be only 9,000 of the most ecologically vital megabreeders left in the fish’s North American stock, enough for the entire population of New York to have a final bite (or two) of high-grade otoro sushi. The Bluefin Tuna is a magnificent fish that’s about to be hunted to extinction. We know it, but we just can’t stop it. Sarkozy has vowed to personally investigate the matter. He met with prime minister Francois Fillon and sports minister Roselyne Bachelot on Wednesday to discuss ways to reform French soccer. The President of France is personally getting involved to fix French Soccer. Got my iPhone 4 about an hour ago. The iPhone is an absolutely beautiful phone. Extremely solid with a finish that makes every other phone I’ve owned feel like a toy. The screen is incredibly sharp. Must be seen to really appreciate how clear everything looks. The screen is closer to the top glass so images look like they’re on the surface of the glass. The internal memory seems slightly smaller or iOS4 is bigger as I’m having trouble copying everything from my nearly full iPhone 3GS on to the iPhone 4. The main camera is super sharp. You can also take pictures with the front facing camera. This baby already feels the rhythm and moves better than I can.